This three piece piston seal, designed for one piece pistons, contains a nitrile rubber seal with tow split plastic anti-extrusion rings. 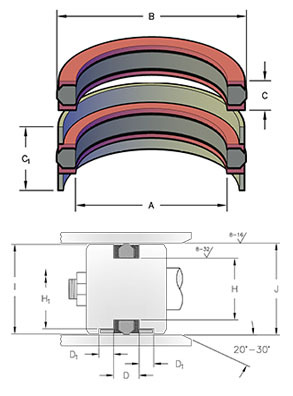 Under pressure, the seal exerts a wedging action on the anti-extrusion rings, reducing the clearance between the bore and the piston, minimizing extrusion. Sales part numbers ending in W include two wear rings.